In 2002, Hao Jingfang was awarded First Prize in the New Concept Writing Competition. She gained her undergraduate degree from Tsinghua University’s Department of Physics and her PhD from the same university in Economics and Management in 2012. Her fiction has appeared in various publications, including Mengya, Science Fiction World, and ZUI Found. She has published two full–length novels, Wandering Maearth and Return to Charon; a book of cultural essays, Europe in Time; and the short story collection, Star Travellers. Her fiction has appeared before in English translation in Lightspeed. Ken Liu (kenliu.name) is an author and translator of speculative fiction, as well as a lawyer and programmer. A winner of the Nebula, Hugo, and World Fantasy Awards, he has been published in The Magazine of Fantasy & Science Fiction, Asimov’s, Analog, Clarkesworld, Lightspeed, and Strange Horizons, among other places. He lives with his family near Boston, Massachusetts. Ken’s debut novel, The Grace of Kings, the first in a silkpunk epic fantasy series, was published by Saga Press, Simon & Schuster’s new genre fiction imprint, in April 2015. Saga also published a collection of his short stories later in the year. Katherine weighs galaxies for a living, and builds worlds in her spare time. She is addicted to chocolate and Japanese logic puzzles. Brian K. Lowe is a 21st century SF author who, judging by his cell phone, still lives in the 20th century. His stories have appeared in Orson Scott Card’s Intergalactic Medicine Show, Buzzy Mag, and numerous times in Daily Science Fiction. “Rights and Wrongs” originally appeared in IGMS in March 2014. He has self-published three novels: The Invisible City (SF) in 2013; Once a Knight, a Tale of the Daze of Chivalry (fantasy) in 2014; and The Choking Rain (thriller) in 2014. A complete list of his works and his thoughts on why literature would be vastly improved if everyone would just do things his way can be found at http//:brianklowe.wordpress.com. David D. Levine is the author of novel Arabella of Mars (Tor 2016) and over fifty SF and fantasy stories. His story “Tk’Tk’Tk” won the Hugo Award, and he has been shortlisted for awards including the Hugo, Nebula, Campbell, and Sturgeon. 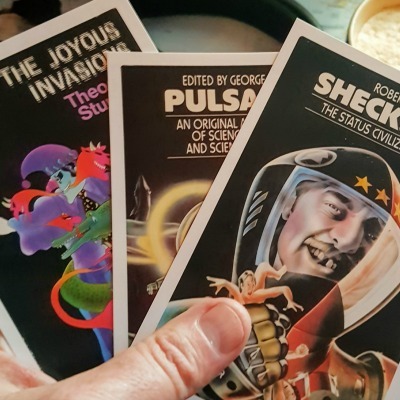 Stories have appeared in Asimov’s, Analog, F&SF, and multiple Year’s Best anthologies as well as award-winning collection Space Magic from Wheatland Press. David is a contributor to George R. R. Martin’s bestselling shared-world series Wild Cards. He is also a member of publishing cooperative Book View Cafe and of nonprofit organization Oregon Science Fiction Conventions Inc. He has narrated podcasts for Escape Pod, PodCastle, and StarShipSofa, and his video “Dr. Talon’s Letter to the Editor” was a finalist for the Parsec Award. In 2010 he spent two weeks at a simulated Mars base in the Utah desert. David lives in Portland, Oregon with his wife Kate Yule. His web site is www.daviddlevine.com.